What do you do when you’re filming an action movie and you need a villain who can fight the hero in an kickass, choreographed set piece that ends with his death? Why, you use an Awesome Asian Bad Guy, of course! With their knowledge of martial arts and irrelevance to the plot, AABGs make the perfect disposable henchmen. They were all over 80s films like Die Hard and The Karate Kid, appearing for two minutes before being summarily terminated by the leading man. 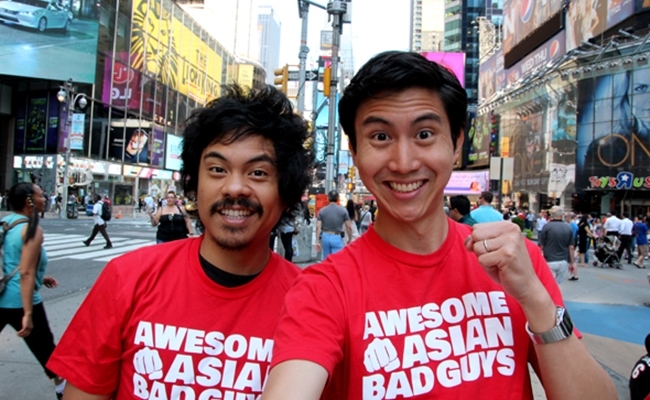 Now, Stephen Dypiangco and Patrick Epino of the National Film Society YouTube channel are hoping to give these ephemeral antagonists their moment in the sun with a new five part web series called Awesome Asian Bad Guys. Awesome Asian Bad Guys will feature appearances from several actors who have a history of playing short-lived Asian villains, including Al Leong (Die Hard, Lethal Weapon) and Yuji Okumoto (Karate Kid 2). The various AABGs will be the central characters of the show’s plot, which will revolves around two filmmakers (presumably Dypiangco and Epino) who are trying to assemble a super team of AABGs to take down a Rich Mobster Bad Guy. The creators describe the tone as “The Expendables meets Dumb and Dumber,” and the team’s recent pitch video makes it pretty clear where the latter part of that comparison comes from. The National Film Society has launched a Kickstarter campaign hoping to raise $50,000 to fund their series. With one week left in the campaign, Dypiangco and Epino still need to raise over $34,000 to meet their goal. Along the way, the pair have released several video updates cataloging their progress on the production, writing, and casting of their project, all presented in their irreverent style. National Film Society is affiliated with PBS, who help to distribute the weekly web series, in which Dypiangco and Epino give viewers their goofy opinions on pop culture and filmmaking. The idea for an Awesome Asian Bad Guys web series stems from a video of the same name that the duo released as part of the National Film Society. In that video, their wide knowledge of AABGs really comes through; you can tell that these two have been preparing for a web series about stereotypical Asian baddies for their entire lives, and it would be great to see their passion project gain the funding it needs.